Who ya gonna call? Dambusters! The new wartime epic from US Gold goes down a bomb. Guess who's making a comeback? It's Willy's Jet-Setting sequel with more POKEs than you ever thought possible. Are you clever enough to unearth the mole and save the world? Become an office-Bond in The Fourth Protocol. How many add-ons can you add on to your Speccy? YS hard man, Stephen Adams, surveys the field. We welcome a new face to the winning YS team. Join them for a full five pages of action packed reviews. This mighty machine code tank attack marks the start of Opportunity Knocks. Don't pass up this chance of typing it in. Discover more commands than you'd ever dreamed of. It's a giveaway! Interface 1 owners, your ROM is revealed. Plus a complete conversion table for all known versions. Have you always longed to write your own adventures? The spirit was willing but the flesh was weak. Well, almost out of thin air we've produced the perfect DIY adventure designer. Frontlines 3 Full frontal YS news - well, it is page 3! Plus Hacking Away, From the Hip and Hard Facts too! Has Sir Clive been torn off a strip? Does Hewson's new game ring a Belle? Can you Relax in a Frankie T-shirt? Has The Stick got a leg to stand on? Who's made a lunar landing on the level? Will you be able to bear Quicksilva's new Rupert game? Find out here! Hair-raising hardware problems? Stephen Adams is the man to put your facts straight. Write to him at Hard Facts ... Hi-Soft assembler and FDS keyboard incompatibility, TVs causing tape loading errors, Using RS232 i/f with EP44 printer, Screen dump to Tandy printer/plotter, Microdrive commands give Nonsense in Basic errors, Microdrive fails with Alphacom printer attached, Spectrum+ upgrade will no longer SAVE reliably, Using Teletext. Are you into POKEing fun? Then send your hacking hints to Andy Pennell ... Manic Miner, Defenda, Project Future, Ad Astra, Jack and the Beanstalk, Road Racer, Invasion of the Body Snatchas, Chuckie Egg 2, Astro Blaster. Typing in UDGs from program listings, YS MegaBasic / Saga keyboard incompatibility, Writing directly to screen memory. If you're constantly clueless about adventures, keep in touch here. Urban Upstart, Hampstead, System 15000. No hacks please, we're gamesplayers. Plus the mad, mad world of Spy vs Spy! Gamesplayers! Get back at the hackers. Enter the Zone! Beach Head, Starion, Dun Darach. Have we got some great software lined up for you! But first a surprise - the hairy hacker is taking his annual rest (he calls it that 'cos it usually lasts a year!) so we welcome a new joystick juror to the bench, Rick Robson. Now join the three Rs - Rick, Roger Willis and Ross Holman as they find out where the arcade action is! Willy or won't he? Well, someone has, 'cos Miner Willy's back in his major follow-up to his first appearance as a jet setter. Find out what he's up to and fear not for all your old POKEs. Chris Wood, Zareh Johannes and David Smith have hacked away and come up with a complete new set. 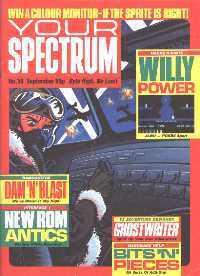 Jet Set Willy 2. Sqd.Ldr. Badger Blenkinsop pushes the starter. The four mighty engines splutter into life. The big Lancaster bomber lurches up the runway and takes off into the night. One of the most daring exploits of the war is about to begin. Now you can join the valiant airmen of 617 Squadron in US Gold's new game Dambusters ... You won't earn your wings back at base - Squadron Leader Ross Holman didn't. He's flown more active missions in Dambusters than anyone else. Prepare for his pre-bomb briefing. You can't trust anybody these days - or almost. What with spies, counter spies, double agents, triple agents, it's a relief to find someone you can rely on - Peter Freebrey takes you into The Fourth Protocol the adventure based on Frederick Forsyth's novel. Now it's up to you to find out who's on your side and who's on theirs. But you'll need all your intelligence for the task. My, how it's grown - almost a MegaSpectrum! Which of these useful little add-ons could you do with on your Speccy? To help you choose, Stephen Adams has done his bit and come up with a piecemeal review of them all. Have you made good your Escape from Castle Rathbone yet? Or are you still haunted by the fiendishly difficult adventure that appeared in last month's YS? Either way you probably never noticed the ghostly presence of the code that created the adventure. Dougie Bern, a shadow of his former self, reveals all ... or nearly all! If you reckon you know all there is to know about Z80 machine code, prepare for a shock. As well as the documented instructions, there are over a hundred that have been hidden away. David Jones uncovers them and adds the missing info. Now you really can have your chip with everything! Ever since the new Interface 1 ROMs appeared, there's been a lot of confusion over converting from the old to the new. Well, now Andrew Pennell has come up with the complete ROM service! Get Organised! - We've pulled out all the stops to bring you this real time organ program, Recorder. Keith Bowden calls the tune! For Eric Verland, opportunity has knocked. His game Bounzai leads us off on the YS search for six of the best. Now follow that! How'd your programs look on a Ferguson Monitor Colour TV? Design us a prize winning sprite and you could find out. At YS we know your talents are unlimited. Well, now you can prove it. All you have to do is conjure up a small sprite. Easy, eh? And the creator of the best one walks off with the prize of a Ferguson Colour Monitor/TV. Now, that's magic! Was that the postman's knock? It must be your letters! It's the YS scribblers' spot - and there's a bundle of free software for the sender of this month's Star Letter. If you're after a new game, look here first - and save yourself £££s! Join the YS gold rush in the search for those elusive medals. On your marks, get set ... Go! The race is now on to find the YS Champion Gamesplayer of the Year. Join the fun and strike out for the YS Games Gold Medal. It's back! The YS Miracle MegaBasic. You'll only get out what you've put in. It's the free YS billboard.